Daddy is home!!! Yea!!! I have no idea how single parents do it...I am worn out after only a week by myself! It has been a LONG week! Haha! Today when I picked up Hillary Ashton from school, she came running to the car wearing a t-shirt decorated with the same colors I have been scrubbing all week...green, yellow and red. 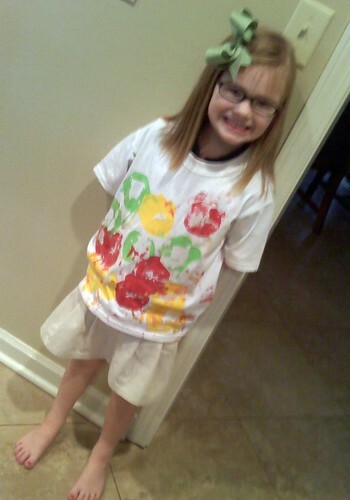 She happily informed me that this is the shirt she made on her first day. The shirt that claimed one BRAND NEW light blue peter pan collared shirt, one BRAND NEW navy blue skirt and one pair of BRAND NEW knee high socks. I am not frustrated at all by the causalities :o) Haha! I have tried everything this week to save the shirt and skirt with NO luck. Obviously they used non-washable paint because they were painting t-shirts. I have tried spray and wash, hairspray, an Oxy Clean gel stick and hydrogen peroxide. I think I am ready to give up. I have been defeated. Thanks for the ideas...I am stocked and ready to battle any other stains that come home this year! Haha! They painted the shirt with apples. She loves it. I would like it more if she would have painted it while wearing a smock...haha! Oh, so sorry the Oxy Gel stick didn't work! I've found in my years on this earth that it sometimes gets to point that it is cheaper and easier on the nerves to replace the item than to keep trying products which are not always cheap.